When initiating a ketogenic diet for the first time many will ask the question, what are ketones or ketone bodies? And what do they have to do with ketosis? For the uninitiated, first reading about low carb, high fat (LCHF) dieting, words such as ketosis or ketone bodies can all be a little confusing. But they don’t need to be. Having an understanding of how fat is metabolised in the absence of carbohydrates will make planning your diet a lot easier. 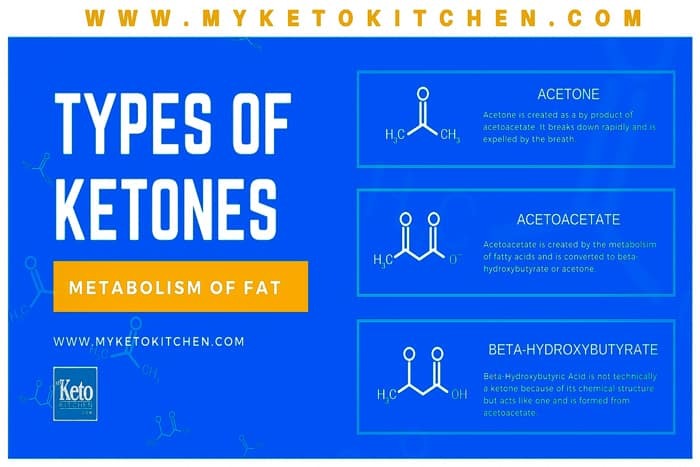 Ketones are what fuels your body when fat is metabolised for energy in the absence of carbohydrates. When you eat a very low carb diet you aim to remove carbohydrates as your bodies main source of fuel. Your goal, through diet, is to turn your bodies energy source to burning fat. When you begin to break down fat as fuel ketone bodies (or known commonly as ketones) are produced. When you starve your body of carbohydrates and there is not enough glucose in your body for fuel and sustainable energy production. Your glycogen stores are depleted. When glycogen gets depleted your insulin and blood sugar levels drop. When there are no sugars available for energy your body turns to fat as its fuel source. Depleting your glycogen and blood sugar is achieved by limiting carbohydrates to less than 5% and protein between 20 – 25% of your daily macronutrients. (Fasting and exercise also help deplete glycogen stores). As your body begins breaking down fats, ketone bodies are produced by oxidization putting you in a state of ketosis. Science has shown that a higher level of ketones flowing through your body has the possible benefits of improving: Mood, longer lasting energy, lowering blood pressure, reversing insulin resistance and cognitive enhancements. What Are Ketones Health Benefits? Long lasting mental benefits, preventing brain fog throughout the day and keeping stress levels low. Enhanced focus and thought processing. The long-lasting energy that high-fat, low-carb diets provide is valuable for endurance athletes, sportspeople and those who exercise at length. For around a century ketosis has been used to treat people with epilepsy to control seizures. (in some, this does not work for all). Fat loss. The fact that low carb dieting leads to the body turning fat into ketone bodies has the benefit of burning the bodies stored fat. Blunting hunger pangs. The ketogenic diet controls the hunger hormone ghrelin. Controlling ghrelin helps you keep from craving food. Research indicates that an LCHF diet has the potential to reverse insulin resistance and possibly type two diabetes. (Under a controlled environment, overseen by a medical professional). Has a positive impact on blood lipid levels and heart health. Acetone – This is responsible for the keto breath often encountered by those in ketosis. ACAC – Acetoacetic acid – Also known as, “diabetic acid”, is produced in the mitochondria of the liver through the metabolism of beta-hydroxybutyrate. BHB – Beta-Hydroxybutyric acid – Technically is not a ketone but is grouped as an important element in the creation of ketones and ketosis. BHB is created in the liver by the metabolism of fatty acids. There are a variety of devices available for measuring the ketone levels in one’s body. You can use a blood ketone monitor like the one here, a breath ketone meter that measures the acetate on your breath or you can test with urine test strips. To get a better idea of measuring ketone levels read our in-depth review of ketone monitors and devices. There are several methods that many people use to raise their ketone levels. Also used for extra energy throughout the day or while initiating a ketogenic diet. One method is through exogenous ketones such as BHB Salts. BHB Salts are usually mixed with water or other sugar-free beverages. BHB Salts are an exogenous Beta-Hydroxybutyrate supplement and work to create ketone bodies fast. MCT Oil is a long time tried and tested way of bringing one’s ketones levels up fast, you can get MCT Oil here or at many health food shops. An alternative to MCT Oil is MCT Powder that is excellent as a crema with coffee or for use in fat bomb recipes. Fasting has also been known to bring on a state of ketosis sooner. Note: Before taking on any new diet plan or trying any of the methods above, always consult a medical professional. In particular, those who suffer from any form of diabetes or have other metabolic problems. Ketoacidosis is a state where your blood turns acidic. Ketoacidosis occurs mostly in those who are suffering an illness (Diabetes) but also can occur with people consuming large amounts of alcohol. The keto diet is a very healthy diet backed by science, learn it alongside consulting medical professionals and you will see yourself in great shape, physically and mentally. The next time someone asks, what are ketones? You’ll be able to give them the run down.